Chief Davis is from Byram, Mississippi which is just outside of Jackson. He is a graduate of the University of Southern Mississippi, majoring in Criminal Justice and Forensic Science. The horrific experience of losing his father to violent crime as a little boy, set the tone for his career in Law Enforcement. “I remember when we got the phone call about my father’s murder and right then and there I made the decision to become a policeman and I promised my mother that we would see justice served,” Davis said. It was a very tough time growing up without a father but it also provided Keith Davis with a unique perspective about life and the importance of good role models and proper guidance for kids. In the process of building his career in law enforcement, Davis discovered that reaching out to troubled youth and finding ways to make a difference in their lives was a very powerful calling that he could not deny. Working for K-Mart in the Loss Prevention division was the catalyst of what would become an eighteen year career in law enforcement. Davis was living in Byram at the time but was looking forward to moving to the Coast in order to pursue a career as a police officer. He had made some contacts in the city of Gulfport Police Department and was eager to start his training. He began in the Patrol Division. In the mid 90’s, there was a special crimes unit where the Chief of Police put police officers on bicycles. It was a program that was used in many major cities across the country and proved to be quite successful. Davis was selected to be in the Bicycle Unit and remained there for several years. Part of the duties of the job included the distribution of police information cards to the youth so that they would have immediate access to the names and phone numbers of officers that patrolled the area in the event that they needed assistance. “It was a very, very effective tool in bridging the gap between the kids and law enforcement, it made us accessible,” Davis said. The Bicycle Unit was extremely successful in attacking street level, open market, drug activity. The drug dealers were not used to seeing police officers on bicycles so they were not prepared for them to simply ride up and intervene to make arrests and foil their illicit activities. “Our unit was very effective in crime prevention, it worked really well,” Davis said. During his time with the Gulfport PD Bicycle Patrol, Keith Davis became acquainted with a young Community Service Technician by the name of Wendy Swetman, who is now a prominent figure on the Harrison County Board of Supervisors. He and Davis had a great deal in common, in particular the passion for law enforcement and they became very close friends. They roomed together in the Swetman family home in Biloxi. “I consider Wendy my brother and we have had some amazing times through the years, I admire him greatly as well,” Davis said. Following his service in the special crimes unit, Keith Davis became a detective. He spent over a year in the division with an emphasis on narcotics enforcement. He soon requested a transfer to the Narcotics Division and was assigned to the Coastal Narcotics Enforcement Team for two years. Davis is extremely proud of his record of solving a great many drug related cases and sending many drug dealers to prison. “This is a very serious problem on the Coast, and I am quite sure that the general public is unaware of how bad it really is. During my career I have seen so many changes. The Crack epidemic came first, then there was a short spell where Heroine was very strong and it was coming out of New Orleans, next came Meth and now we are dealing more with the synthetic Spice and prescription drugs,” Davis said. He later returned to the Gulfport Bicycle Unit as the officer in charge where he remained until leaving to work in the Sheriff’s office. When George Payne was elected Sheriff, Davis opted to leave with him to begin a new phase of his career. In the Sheriff’s office, Davis was assigned to the Drug Enforcement Administration as a Task Force Officer. He remained there for two years and then made the decision to work in General Investigations for the Harrison County Sheriff’s Department. Upon leaving the Harrison County Sheriff’s office, Davis became the Chief of Police of the Mississippi Gulf Coast Community College in Perkinston, Mississippi. “It was quite a difference going from municipal law enforcement to county law enforcement to campus police. There was a host of new issues to deal with and although we looked after the faculty and the students, our main focus was on the student body,” Davis said. When he took over at Perk, Chief Davis put new programs in place to enhance the campus police department and he devised the first ever Emergency Response Plan for the college. “This is my most proud accomplishment during my time at Perk, and to my knowledge, the plan is still in effect today,” he said. The plan was based on the National Incident Command System model and it laid out the procedures to follow in the event of any emergency that occur on the college campus, be it weather related or an active shooter event, or fire. “It was very important for the campus to have a good solid plan in place and ready to put into practice because once an event starts it is too late to figure out how to proceed when time is of the essence,” Chief Davis said. From January, 2007 to September, 2008 Keith Davis served as the Chief of Police at Perk. The city of D’Iberville was forming it’s first police department. Chief Wayne Payne felt that Chief Davis would be a valuable asset to the new police force and urged him to come to D’Iberville. “It began with just a few police officers but I am very proud to say it has grown and evolved over the years and is now a very successful police department in it’s own right. I am also very proud to have worked with Chief Payne and my many fellow D’Iberville officers. I am so honored that I was a part of the department’s development,” he said. Keith Davis was the Captain in charge of Investigations under Chief Payne. Things were going quite well in D’Iberville and Davis was extremely happy in his job. One day he received a phone call from a minister from the city of Moss Point who was calling to inform him that very soon the city would be in need of a new police chief. The gentleman thought that Keith Davis would be perfect for the position and urged him to take it. Davis was well aware of the many problems that existed within the police department there and the fact that crime was at an all time high. He had no intention of leaving D’Iberville, let alone to take over a situation that was in total shambles. “Almost immediately, I began getting messages in my ear. It was only two words but I heard it over and over again for the entire day, ‘the children.’ The message continued and actually woke me up the next morning. 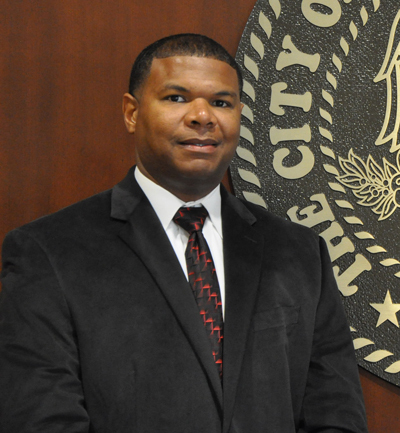 There was no doubt in my mind that God was directing me in the path that I needed to follow, and I did what He asked me to do.” Two days later, Davis submitted his resignation and soon thereafter became the new Chief of Police for Moss Point. Since taking over in 2011, the crime rate has dropped significantly and the citizens of Moss Point have a new relationship with their police department. “Moss Point has had so many problems for so many years but there is no doubt in my mind that blessings are here and God is turning things around through me,” Chief Davis said. Davis has implemented a number of outreach programs aimed at the youth of Moss Point to teach them that police officers are there to help them and keep them safe, that they can be trusted and depended upon to help keep crime from happening. The number one priority for Chief Davis was to change the image of the Moss Point Police Department and make his department more accessible to the public. “When I took over, it was clear to me that the community simply did not trust or even like the police. If the public and the police department do not work together, then crime is assured,” Davis said. The first thing Chief Davis did was change the look of the police cars and the style of the uniforms. The staff was also reworked to reflect happy personalities with smiling, helpful attitudes. “We were not going to do business the way it had been done in the past, and we were committed to regain the public trust. We had to earn the respect of our citizens so I began to make public appearances and speak to them about the many changes that had taken place and how things would be very different under my leadership,” Davis said. In plain clothes most days, wearing a shirt and tie, Chief Davis is accessible and very approachable to everyone. When time permits, he will sit down with whomever comes by the station and personally address their situation and do whatever he can to fix the problem. “This is a new day in law enforcement and we are committed to earning the people’s trust,” he said. Under the new leadership of Chief Davis, it is clear that the police officers are also happier and more connected to the community than ever before. There is a new sense of pride, the officers are very visible and always out on patrol throughout the city. The officers reflect a new beginning in crime prevention and the response from the public is very favorable. It took close to a year to start to see a difference but all the changes continue to prove that the violent crime rate is dropping significantly and the people of Moss Point have begun to have faith in their police department again. “After taking office, there were many times that I thought this was not going to work and nothing I could do would matter. The property room was in complete disarray and stacks and stacks of cases were at the D.A’s office were left unsolved and the criminals were going free. The message was that criminals could do whatever they chose to do because they would not be held accountable! The first thing I did was reopen those old cases and issue arrests, sending my message loud and clear,” Chief Davis said. The men and women of the Moss Point PD are depended upon by Chief Davis to make the programs work. Every position has it’s role, from the dispatcher to the Deputy Chief. Everyone is a team player and everyone is equal in their importance. The force consists of 33 officers, and 14 support staff in the courts, jail and dispatch. In order to recruit potential candidates for training, Chief Davis has representatives at job fairs and makes periodic announcements through the media. “Every chance I get, I go and speak to young police officers at the Academy about the many opportunities for them in Moss Point,” he said. In order to be eligible to apply, you must be 21 years of age, a college degree is preferred by not required, you must be of solid moral character with no criminal history, and you must meet the requirements of a physical fitness test. “I also insist that my officers be able to communicate well and always be respectful of the public,” Chief Davis said. Chief Davis continues to put new procedures in place. A new manual for the police officers was rewritten and approved earlier this year. It was distributed to the staff and they are currently operating under the new Standard Operating Procedure (SOP). In addition, the day to day operations involves restructuring the department. Prior administrations decimated the ranking structure. Currently. Chief Davis and his administration are exploring new ways to restore the structure without adding to the annual budget. If he had a choice, Davis would prefer to be out, making the rounds and interacting with the public but the job entails that he remain at the precinct most of the time. Most of his day he works on policy and making sure his department is compliant with state and federal government regulations. He handles all the day to day operations and frequently is booked for public speaking engagements. Chief Davis makes numerous public appearances each month. “I never turn down an opportunity to speak in public, it is a very important part of my job to keep everyone well informed and up to date,” he said. There is nothing more important to Chief Davis than his commitment to the Moss Point youth. In spite of budget woes, grants have been secured through the Department of Justice, Juvenile Accountability Block Grant Program. With this funding, the Moss Point PD is implementing DARE. Next month, the newly selected DARE officer will attend his training in Georgia. It is a vital program that makes quite a difference. “DARE educates kids and makes it clear how very dangerous drugs, alcohol, and violence are,” Chief Davis said. In addition, the grant will allow for smaller programs to go into practice. “Camping with the Chief” is a personal program developed by Chief Davis, that will be used to reward children for attending school each day. Truancy is a serious problem in Moss Point schools. When children are identified as good students who go to school each day, they will get a very special outing with Chief Davis, a camping trip! In addition, the Explorer Program will be available for teens. This is a wonderful opportunity for young men and women to work within the police department! They wear special uniforms and are permitted to experience a select number of tasks, always safe and completely monitored by actual police officers. “It is not uncommon for these youngsters to start thinking about a career in law enforcement after having this opportunity to see how things work on a day to day basis,” Chief Davis said. Less than 1% of all police officers across the country are accepted into the FBI National Academy. Chief Davis is a graduate of the Academy which is located in Quantico, Virginia. The training is rigorous and intense, preparing only the very best in the nation to protect the United States and uphold the laws. Chief Davis attended the Academy during the 243rd session, from September 26 – December 10, 2010. “This was such an honor and the highlight of my career. It is something that I am incredibly proud of,” he said. Everyone needs a respite now and again from their chosen profession, and Chief Davis is no exception. He is the father of two daughters who unfortunately, live quite far away. Spending time together is most important and they see one another as often as possible. His oldest daughter is 21 and attends college, the youngest is 12. His favorite way to unwind is spending time at the gym and staying fit. He loves all sports, in particular basketball, but salt water fishing is number one. “Growing up with my mom, we always did a lot of fresh water fishing but living here on the Coast, getting out to the rigs in a boat is my favorite way to go,” he said. Chief Davis recently took up Golf which he thoroughly enjoys but admitted he needs a lot of practice. “It’s my new passion. I am pretty bad right now but I love the challenge and I keep improving slowly but surely,” he added. Chief Davis is also fiercely committed to a charity that provides for the surviving children of slain police officers. “Growing up without a father, it’s a very rough road. This is such an important organization that helps so many,” he said. When Keith Davis decided to take on the monumental task of righting the wrongs in the Moss Point Police Department, he knew it was a terrifying prospect but he rolled up his sleeves and carefully and methodically turned things around. He is the consummate professional but more importantly, he is good and kind and governed by his faith which is an unbeatable combination. The city is committed to taking back the streets from the criminals who choose to do wrong.